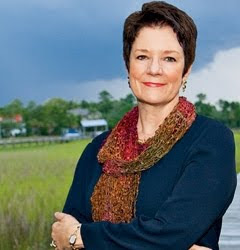 Sue Monk Kidd was raised in the tiny town of Sylvester, Georgia, a place that deeply influenced the writing of her first novel The Secret Life of Bees. She graduated from Texas Christian University, married Sanford (Sandy) Kidd, and they had two children, Bob and Ann. At the age of thirty, she enrolled in writing classes with the intention of writing fiction, but was soon diverted to non-fiction and began a career as a freelancer. Sue's desire to write fiction returned in her forties, and she enrolled in a graduate writing course at Emory University, as well as studying at Sewanee, Bread Loaf and other writers' conferences. She wrote and published short stories in small literary journals for which she garnered several awards. Today Sue lives beside a salt marsh near Charleston, South Carolina with her husband, Sandy, and their black lab, Lily. When her first novel, The Secret Life of Bees was published by Viking in 2002, it became a genuine literary phenomenon. The novel tells the story of fourteen year old Lily, who runs away with her black housekeeper in 1964 in South Carolina, and of the sanctuary they find in the home of three beekeeping sisters. The Secret Life of Bees has sold more than 6 million copies, spent over 2 ½ years on the New York Times bestseller list and been published in 35 countries. It was awarded the 2004 Book Sense Paperback book of the Year, nominated for the Orange Prize in England, and chosen as Good Morning America's Read This! Book Club pick. Taught widely now in high school and college classrooms, The Secret Life of Bees is fast becoming a modern classic. It was produced on stage in New York by The American Place Theater and adapted into a movie by Fox Searchlight in 2008, which won the People’s Choice and the NAACP Image awards for Best Picture. Sue's second novel, The Mermaid Chair, has sold nearly 2 million copies since its publication by Viking in the Spring of 2005. Set on a South Carolina barrier island, it tells the story of 42 year old Jessie Sullivan, a married woman who falls in love with a Benedictine monk, and explores themes of mid life marriage and self-awakening. The Mermaid Chair reached the #1 spot on the New York Times bestseller list and remained on the hardcover and paperback lists for nine months. Winner of the 2005 Quill Award for General Fiction, the novel has been translated into 24 languages and was produced as a television movie by Lifetime. Check out Sue's website for more info on appearances and news! Sue Monk Kidd seems to have a lot of ideas and a vivid imagination. I know they made a movie out of the book The Secret Life of Bees but I have neither read the book nor watched the movie. I've read the Secret Life of Bees anjd I loved it. So different to my nromal reading but it is a brilliant book! I did not know she had read so many books-traveling with Pomegrants is on my wish list. Great introduction to an author I'm not familiar with. A zillion thanks darling!